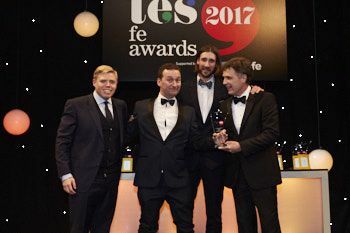 The winners of the 2017 TES FE Awards, held in association with The Education and Training Foundation, were announced on Friday 24 February 2017 at the Grosvenor House Hotel, Park Lane, London. Dr John Graystone became a schoolteacher in 1970 and has dedicated the decades since to the world of education. Graystone has held a number of senior managerial positions in the FE sector. He is currently executive chair of the board for awarding body Agored Cymru, and before this was interim director of adult learning charity Niace Cymru (now the Learning and Work Institute Wales). He also sits on the boards of Bridgend and Merthyr Tydfil colleges, and is chair of WEA YMCA CC Cymru, an adult learning charity formed in 2015. From 2001 to 2014, Graystone was chief executive of ColegauCymru, the national body representing all FE colleges in Wales. 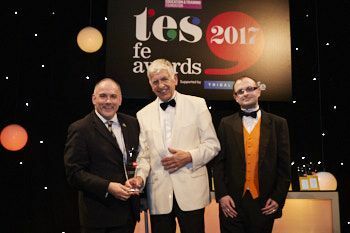 He represents ColegauCymru on the educational board of the Wales Journal of Education and on the Association of Colleges Beacon Awards steering committee. 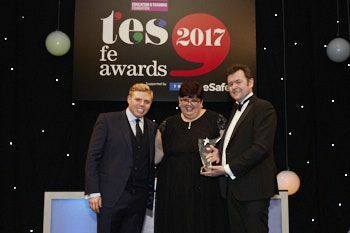 The judging panel was unanimous in its decision that South Tyneside College should be recognised as the overall FE provider of the year, with one judge saying it was a “no-brainer”. South Tyneside’s commitment to the educational advancement and career attainment of its learners has made it an exceptional centre of learning. As well as impressive work within the college, such as delivering clear progression routes into work, it has also had significant impact in the wider community. 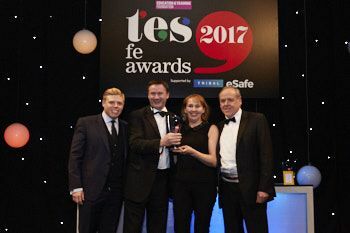 The creation of South Tyneside College Academy Trust to run Ridgeway Primary Academy – a once struggling but now improving school – and the partnership with Monkwearmouth Academy to create Monkwearmouth Sixth Form College, show that South Tyneside is reaching beyond its walls to help neighbouring institutions. South Shields Marine School and Marine and Offshore Safety Training Centre are significant drivers of economic prosperity. The centre has 11,000 full- and part-time students, each assigned a personal learning coach to help them achieve their potential. Judith Larsen is a tutor at Bedford College and has been teaching for six years. Before this, she was an operations manager in the IT industry, and was inspired to change career while completing a foundation degree and discovering she had a passion for helping her fellow students. During her time at the college, she has overseen a 220 per cent increase in enrolments on the HNC/HND computing systems development course, as well as an impressive rise in the pass rate. The judges felt Larsen’s entry stood out in a strong field because of her “passion and dedication”. 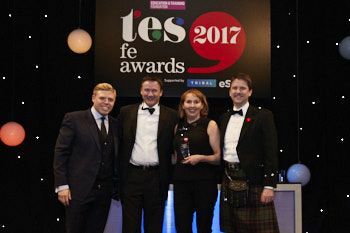 For example, she set up regional heats for WorldSkills in IT at Bedford College, and six of her students were selected to take part in a showcase event at the WorldSkills UK competition in 2015. One student, Oliver Davis, won gold and will represent the UK at WorldSkills Abu Dhabi in 2017. Last year, Larsen organised a progression event for learners, which involved more than 30 local employers, as well as apprenticeship and higher education providers. 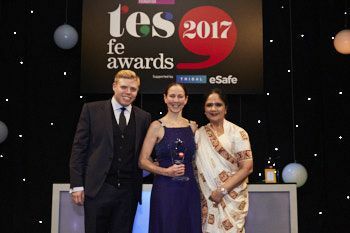 The judges praised Larsen for her focus on “top-end excellence and standards setting but also showing passion and dedication, and a commitment to learners”. South Devon College has a long and successful track record of developing curricula in partnership with local employers. In South Devon and Torbay, there is a growing high-tech sector, with a cluster of businesses employing more than 1,000 people. The college has worked to tailor apprenticeships and higher education provision to ensure learners leave with the skills to meet the needs of this industry. In a strategic attempt to align the college’s offer with local industry, South Devon College has introduced a high-tech and digital department, which concentrates on working with and supporting local businesses at all levels. The college’s submission says that it now provides “a pipeline of high-quality students ready to enter employment”, and it is also an active member of the Torbay Development Agency, an employer-based forum that meets regularly to discuss technical advancements, economic updates and business opportunities. South Devon College’s high-tech and digital department is seen as a hub of innovation, supporting businesses with a host of new ideas and developments. Under chief executive Garry Phillips, Ealing, Hammersmith and West London College has introduced a digital education strategy that has built on Google for Education technology to revitalise students’ attitude to work, both inside and outside the classroom. ICT students can now explore a data centre via a 360° tour, rather than a textbook, and tourism and leisure students can plot a guided tour route online to experience attractions before actually visiting them. Staff training and communication are key to the success of the project, and a dedicated team of 25 people have been trained as “Google Innovators” to help other teachers to develop their use of technology. As a result, there has been a 17.3 per cent increase in English and maths achievement, along with a 12 per cent rise in achievement across all subjects since 2014, as students embrace a more self-directed approach to learning. 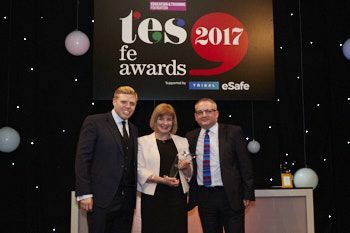 There has also been a 10 per cent improvement in English and maths exam attendance because the technology assists with administration and remotely assessing students who cannot come into college for health or childcare reasons. 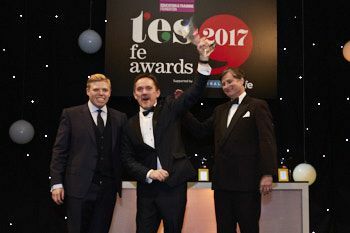 According to the judging panel, Ealing, Hammersmith and West London College was the “standout” candidate in this category. The judges highlighted the vision and leadership demonstrated. “It was the whole institution, it was a holistic approach, it was led from the top,” they said. Hart Learning and Development was launched in August 2015 by North Hertfordshire College as a discrete company, focused on making the most of the commercial opportunities offered by the expansion of the apprenticeship programme and the introduction of the levy on large employers. This was supported by an ambitious marketing campaign, intended to start a conversation with employers about emerging talent, and increase volumes, revenues and profitability. The campaign was supported by three second-tier initiatives: “A Little More Conversation”, which engaged 30 businesses in the development of an employability standard; “We Love Apprenticeships”, which focused on small and medium-sized employers in Hertfordshire; and the “Hart L&D Levy Guide”, initially produced in April 2016 and updated in autumn 2016. In the 12 months after it was formed, Hart Learning and Development increased direct-delivery apprenticeship and traineeship starts by more than 80 per cent, raised apprenticeship success rates by 11 per cent and secured positive destinations for 67 per cent of traineeship learners. Like-for-like profitability was increased by more than £1 million and new client contracts worth more than £4 million were secured. The judges felt that the calibre of entries in this category was high, but unanimously agreed that the “completely amazing” work of West Suffolk College’s Mars (maths, art, religion and science) Award project “leaped out”. The initiative was devised by Derek Johnson, director of the school of art and design. The aim of the Mars Award is to encourage students to “embrace the rich wonders of a wider world” and to “open and develop inquisitive minds”. All 400 of the college’s art and design students work collaboratively with the school of science on a set of rich and challenging assignments, which are evaluated by an invited panel of judges. This year, the overall winner was Lauren Jones, a graphic design student who explored religion, mathematics and the periodic table, reimagining the chemical symbols in the process. Manchester Adult Education Service’s Talk English team has developed innovative and sustainable community-based programmes to improve people’s English language skills. It has also helped residents of the city to gain wider skills, boost their employability, enhance their wellbeing and secure greater access to support services. The team delivers a variety of training courses to prepare people for volunteering on the project, as well as language courses and activities. In 2015-16, more than 120 volunteers were recruited and trained as teachers and “Talk English Friends” in Manchester. In the same year, Talk English staff and volunteers supported more than 800 Manchester residents to learn English through 25 courses and a variety of activities. These included “Create and Talk English” in partnership with Manchester Art Gallery, “Discover and Talk English” with Manchester Museum, “Walk and Talk English” in local parks and, more recently, “Stay and Play with Talk English” sessions in children’s centres across the city. These engaged parents with children aged under 5, who can often struggle to access English language courses because of the challenges of finding childcare. Many of the volunteers start with no teaching experience and little confidence but leave the project with a level 3 qualification and improved employment prospects. The judges said the initiative was “topical”, and praised its focus on promoting cohesion and supporting communities. Newcastle College established the Autism Academy in 2007. Today it provides support to more than 190 learners on programmes from entry-level courses through to higher education. The 35-strong team has introduced a range of initiatives, including Leading Into Further Education (Life), which ensures young people are given the opportunity to progress in education and in their lives. 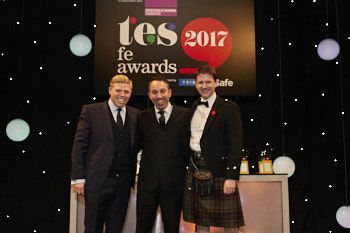 The programme supports transition into college and prepares learners for mainstream FE, while also developing wider life skills in a teaching environment that includes two kitchens, a bathroom and a living area. In 2015-16, 100 per cent of students successfully completed the programme, with 91 per cent progressing on to a full-time course and 9 per cent to employment. Recent funding cuts have meant that the Autism Academy has had to be creative in the support it offers, and it has continued to develop outstanding provision despite the challenges of a diminishing budget. 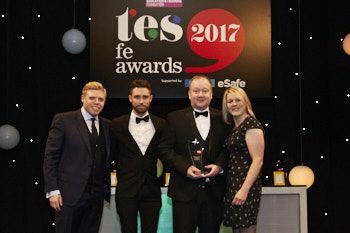 Most recently, the team won a contract with the Autism Education Trust to deliver the “making sense of autism” programme, which is supported by the Department for Education and offers face to-face training for professionals working with young people over the age of 16 who have autism. The judges were highly impressed with Newcastle College’s work in this area, and described its offering as “well-thought-out and effective”. 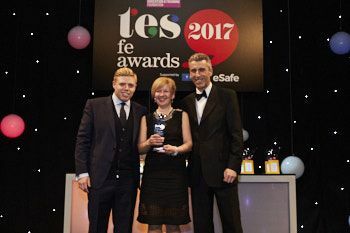 This award celebrates the exceptional performance of an independent learning provider. This year, the judges felt that MPCT’s “impressive” all-round work stood out. Since its formation in 1999, MPCT has been “dedicated to offering opportunities to young people through training and education”. The organisation is made up of a number of training outlets across schools, colleges and sports facilities in England and Wales. In 2014, MPCT was rated “outstanding” in all areas by Ofsted. And in 2016, it reached its 10,000th enrolment. Over the past year, MPCT has pioneered the use of “physical literacy” as a vehicle to engage learners in maths and English programmes. The college has set the benchmark for providers across the country on physical literacy, and some universities are also now embedding the approach into their PGCE programmes. To ensure a positive experience, the college provides innovative and active support known as the “MPCT Way” – a holistic approach that blends active learning within a context of physical and personal development, resulting in outstanding impact and achievements. In 2016, the progression rate was 86 per cent. 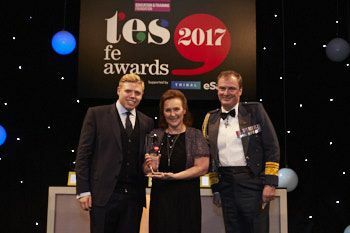 The judges said MPCT delivered exceptional results for learners, and they acknowledged that being graded “outstanding” by Ofsted was “no small task”, given that it required the provider to demonstrate levels of excellence and consistency across all its sites. “A deserving winner,” they added. 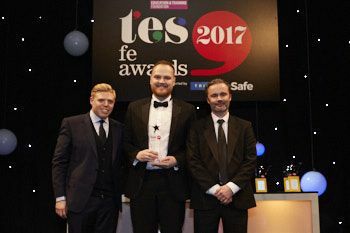 South Tyneside College was one of a number of highly impressive entries in this category, but judges decided that its “outstanding” employment rate for learners put it ahead of the field. By forging connections with businesses and organisations within and outside the local area, South Tyneside College provides an exceptional level of learning experiences for its students. One example of the college’s successful outreach is its support for a new £12 million health centre within South Tyneside District Hospital, with students helping in its hair salon, cafe and shop. The college has also developed short courses that link it more closely to the community by supporting people to learn skills and gain qualifications. South Tyneside’s Marine and Offshore Safety Training Centre offers essential offshore training to 11,000 full- and part-time students. After completing the course, more than 90 per cent of learners progress into either employment or further study. The pass rate at intermediate level is 77.8 per cent, significantly higher than the national average of 68.4 per cent. The college was rated “good” by Ofsted after a short inspection last year. Inspectors praised its “clear strategy” for meeting local skills needs and its “effective links with employers, local authorities and local enterprise partnerships”. 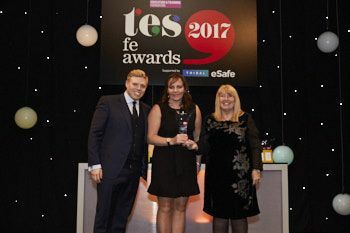 The judges said that South Tyneside, led by principal Lindsey Whiterod, was “a brilliant example of a college with a breadth of skills offers”. This category celebrates providers whose approach to work-based training is out of the ordinary. Pendennis Shipyard began offering apprenticeships in 1998; since then, more than 160 people have completed the unique programme. The scheme develops the skills apprentices will need to pursue a career in shipping. At the end of their first year, trainees obtain a level 2 qualification in engineering, fabrication and joinery, as well as having started a level 3 electrical programme. Pendennis holds regular meetings with Cornwall College to ensure learners are supported and additional training requirements are met. Judges particularly praised the progression routes into sustainable employment. The company provides a post-apprenticeship training scheme that gives learners four options: enrol on a higher apprenticeship programme to gain an HNC or foundation degree; take their training to degree level; pursue an in-house management training scheme; or take short courses to develop their skills and knowledge. The judges felt that Winstanley College’s “sheer range of good practice”, and the extensive evidence that it was going above and beyond to support its local community, gave it the edge in this competitive category. Winstanley has been rated “outstanding” by Ofsted since 2000, with its most recent full inspection taking place in 2007. Standards have remained high, with impressive outcomes for students. More than 90 per cent are highly satisfied with their experience at the college, and applications have increased by 28 per cent since 2009. Students often progress to leading universities, with about 40 per cent taking up places at Russell Group institutions every year, and an overall progression rate of 85 per cent. The college delivers access programmes for more than 150 sixth-form students every year – for its own learners and those from nearby sixth forms. In partnership with local schools, it runs a programme for academically able students who might not otherwise aspire to further academic study. Winstanley has also established a peer review and development group with other sixth-form colleges to facilitate joint lesson observations, self-assessment and CPD. The partnership has supported all the colleges to achieve “good” or “outstanding” Ofsted ratings.  This new category has been introduced to recognise the administrative and professional services teams working behind the scenes at colleges and training providers – so often the unsung heroes of the sector. 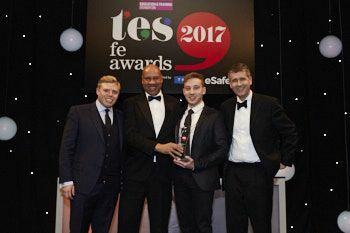 In Peterborough Regional College’s facilities team, the award has a worthy inaugural winner. The team supports 9,000 learners and 800 staff across the college’s main 25-acre campus and four other locations. Team members have worked to continually improve environmental performance, resulting in a 25 per cent decrease in gas usage and a 50 per cent fall in water usage, with 100 per cent of waste recycled or supplied to power stations. Despite an increase in buildings and ICT equipment, electricity use has remained constant for seven years. 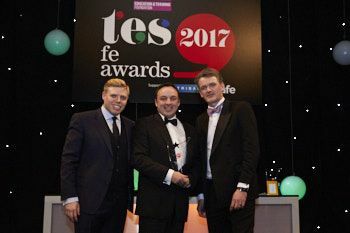 The college’s work has been recognised in the Green Apple Awards for environmental best practice. Team members place learners – and especially high-needs learners – at the heart of what they do. This year, lift facilities were refurbished to meet the needs of wheelchair users, and the college is registered with Disabled Go, which regularly gives advice on improvements for students with access challenges.